Sad to read in TRP today that Rims has been forced to retire after his stroke in January. Great servant who has got better and better over the years. At least he is healthy as things could have been far worse. Edited 1 time(s). Last edit at 08/07/2018 07:56 by fatheralice. Always liked watching Carl play,all the best for the future Carl. Good luck with whatever you do Carl, a real gent and great clubman. Proud to watch Carl play. Not just a class play but a class gent off the pitch. What a shame simply a great club man 100% effort and one of very best scrummagers- he will be missed. Just goes to show what a tough game this is - a legend thanks Carl and very best wishes for the future. Gutted for him and personally a bit disappointed to read this in the paper first rather than having the club make announcement first. His attitude to this massive setback has been first class and the best of luck to him in his future. 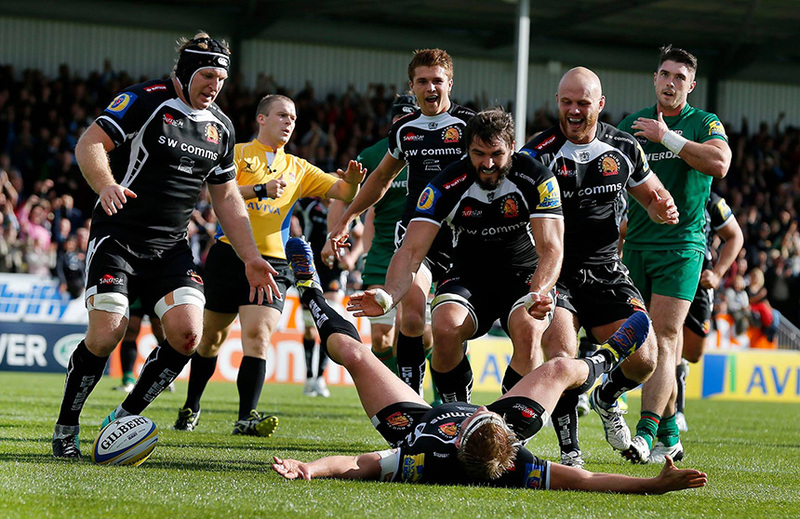 Thanks Carl for your massive contribution to rugby at Exeter Chiefs. Will always remember you cutting a great angle and crashing over for a try against ??? I am sure someone will remind me who the oppo were. Great memory away to Connacht, late in the evening after the game, on a Chiefs boys night out there were Rimmer and Scaysbrook deep in conversation, oblivious to all the mayhem going on all around them! Great times,good luck Rimmer. & as for the Kai & Rims show at Steeno & Friends - priceless !!! Great servant and 110% trier, allways giving his best when I have seen him. Very best of luck in whatever you do Carl to you and your family. I always looked forward to watching Carl, usually from the bench. The scrum was never weakened and he made an impact around the park. Good luck for the future Carl. Just a thought: Could'nt the club do a fund raiser in some way for Carl. Northampton and Leicester have agreed to play at Twickers which will raise cash for Rob Horne. The big question for me, was why was no one suggesting we do something for him as such a great team player and good buhy. I'll gladly go to a specified event to mark Carl's great contribution to the team or pay an extra match day fee on my season ticket ... the club can make this happen and we don't know what arrangements they have made with Carl... but nothing has come out yet. I don't want to upset anybody in the club and was aware of sensitivities when we did Blue Feathers tribute ..but we should / must do something. Thanks CCC. Could I ask any posters who have contacts at the club to raise this suggestion? I will gladly do whatever I am asked to do if it helps Carl. Very sad to here that Carl has had to retire. A decent bloke who I've had the pleasure of meeting and known. It would be a fabulous gesture if the club were to arrange something for him or maybe even a bucket collection at the ground?